Kenny Lynch OBE must have tackled just about everything that it's possible to have tried in UK show business. He has performed as a singer, songwriter, dancer, actor, and done stand-up comedy as well as sketches. He has worked in management and production, helping many newcomers into the business. This black cockney kid has come a long way since first singing with his big sister Maxine in 1950. Kenny appeared very frequently on our TV screens during the 1960s and he was such an all-round entertainer that some people may associate him with different things from that period. Certainly, Kenny was a groundbreaking and creative comedian- although today's "alternative" comedy may be thought to tackle taboo subjects, Kenny would doubtless claim that he's done it all years before. Although it was quite usual for comedians to tackle a song at the end of their acts, Kenny's music was a much more important part of his talent than for most. His material was a little different too. He tackled a wide spectrum of music, rather than just the token romantic ballad that drew most comedy acts to a close. Whatever type of song he tackled he always ended up with a truly professional and commercial sound. Although Kenny didn't have that many big hits, all his recordings are well crafted- there's not a dud side among them. He also demonstrated his ear for commercial success by co-writing "Sha La La La Lee" for fellow cockneys- The Small Faces. His co-writer was none other than the legendary Mort Schumann- unlikely though that might seem. 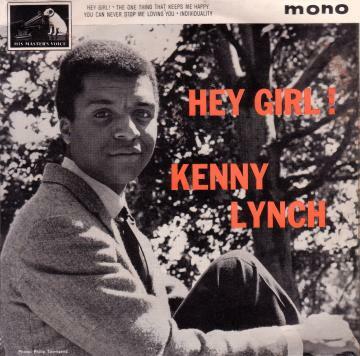 Kenny Lynch EPs are all now very sought after, but very hard to track down. The one shown on the left (7EG8820) was Kenny's first release on that format, and seems to be about the easiest to find- but still commands a good price. Kenny has done a lot less performing in recent years although he has maintained an unusually high output of singles for an artist who peaked in the 1960s. This perseverance probably paid off by giving him a, perhaps unexpected, chart entry in 1983 with "Half The Day's Gone And We Haven't Earned A Penny". More time has perhaps been spent on management and promotion of other artists. However, Kenny still makes the effort to appear for charity from time to time- sometimes at golf, when he gets the chance. HMV 7EG8820 1963 "Hey Girl!" HMV 7EG8855 1964 "Kenny Lynch"
HMV 7EG8881 1965 "What Am I To You?"